Looking for flights from Hong Kong? 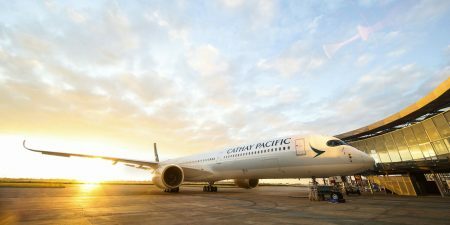 Cathay Pacific offers competitive fares to more than 90 destinations across Asia, North America, and Europe. We offer extra legroom in all classes, generous checked baggage allowance, personal in-flight entertainment, and friendly, professional service. Hong Kong International Airport (HKG) is located on Chek Lap Kok Island, and is sometimes referred to as Chek Lap Kok Airport. One of the busiest airports in the world, you’ll find excellent amenities in its two terminals, including a wide range of eateries and shops, an onsite IMAX theatre, and the Dream Come True Education Park. Other amenities include ATMs, currency exchanges, and Wi-Fi. Travelling to Hong Kong Airport is easy thanks to the Airport Express Line, or AEL, that connects with the central business district. Check in for your Cathay Pacific flight at Hong Kong and Kowloon stations, skipping queues at the airport. Regular bus services connect from other parts of Hong Kong. To reach your next destination in comfort and convenience, book your flight from Hong Kong today.